The design concept is slowly teased from the design brief, using a wide range of initial sketches, with limited notes. You must spend time on this aspect of design and be prepared to sketch quickly (thumbnail sketches) and to seek the opinion of other designers and potential customers. Select some of the ideas, after consultation with designers, stakeholders and potential customers and draw them using CAD. This will allow you to rotate, zoom in etc... and begin to refine your designs. Export a variety of views to your design folder / PowerPoint, adding more detailed notes to explain your ideas. 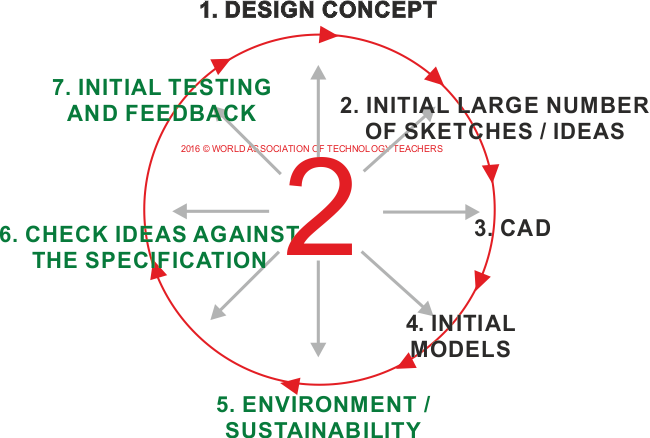 Be prepared at any point to return to sketching and the seek feedback from others (see point 7). At any point during this design cycle, make models which will help you visual your ideas, to test them out, to check the ergonomics, to show to potential customers. You may have other reasons to manufacture initial models. Take a photographic record of your models for your design folder / PowerPoint. At almost every stage, include your knowledge of the environmental needs and requirements of the manufacturer, potential customer and the Law. Also, display your understanding of the 6 Rs (Reduce, Rethink, Refuse, Recycle, Reuse, Repair). Sustainability - What is a Sustainable Forest? Check your ideas and models against the specification you wrote in the previous cycle. This should be a continuous process. You can ask for feedback at any point of the iterative design process. This should also be repeated as many times as you feel there is a need, to help in the development of ideas. There are many different forms including, surveys, questionnaires and focus groups, but one of the most effective is quick written feedback, signed and dated from potential customers / clients. You could also video feedback or record as an audio file. 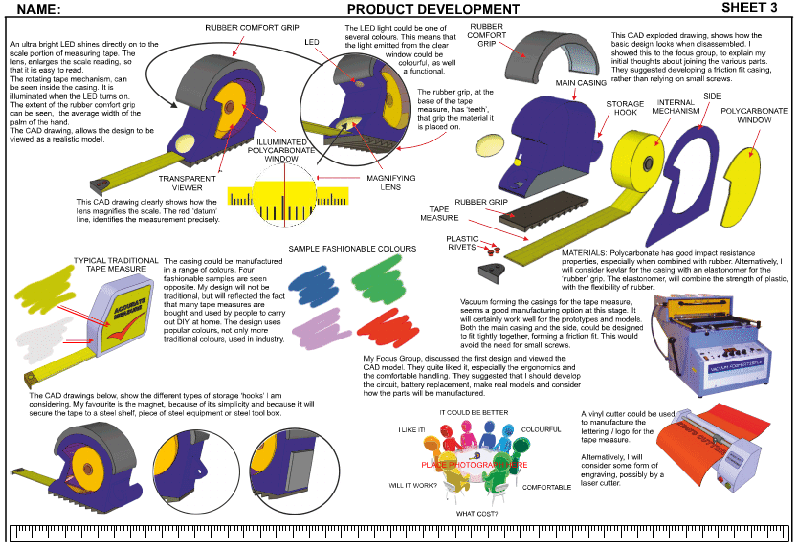 Look at the design sheet below - a focus group has been asked to discuss an initial design for a new tape measure.